Foreigners are buying shares in CSE. 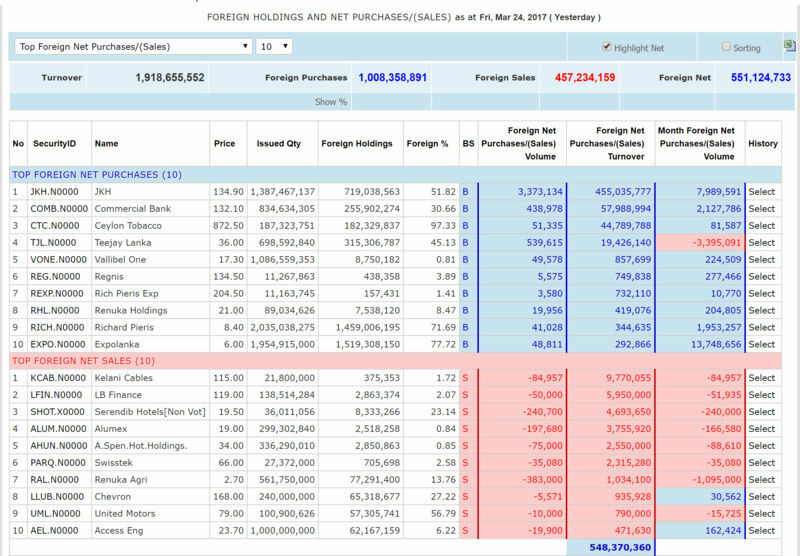 Even with Templeton fund withdrawing 1,475Mln $ investments net may be a foreign inflow now for this year. When Srilankans selling their valuable assets foreigners are buying. Look at yesterday. Our people say interest rates gone up and sell but foreigners say these are good and buying. We all know foreigners made enough money in Srilanka buying at low and selling back to Srilankans at a higher price. Foreigners seems to be having confidence in CSE. Country seems to be on correct path. Yeah dont always follow foreigners, but its at least one bright spot thy're interested in our shares. Buy shares by doing your studies about the share. If you think current level is good to buy then buy it, if it comes down further buy it more. Trust in what you initially justified your purchased. I always pick the share which has the lowest P/E ratio in that particular sector, lowest P/BV and Liquidity. Agree. While foreign buying (limited quantities) may not be the sole criteria for us to make investment decisions, normally if you look at the past behaviour of the market, this is a precursor for positive movement of the market. Feel somewhere manipulation takes place in order to bring down the mkt. YES SOMETHING IS GOING ON, I PROPOSE THE REGULATORS MUST IMPLIMENT THE EARLIER SYSTEM THAT ODD (LESS THAN 100 ) SHARE TRADINGS MUST NOT APPEAR ON THE TICKER AND SHOWN IT IN A SEPARATE COLUMN. Sorry maharaja, unchanged rates alone can not drive da market to a positive sentiment unless they drop da rates, dat would nt happen in near future. So this down trend continues till we have a strong govt & the favourable financial policies. I dont understand why Government working slow.